/Return Management System /A guide to Reports available in the RMS app. In this post, I will explain the reports available in the RMS App. Reports in RMS – Here are five types of reports available in the RMS app as follow. Return By Product – In this report app shows the return percentage of each specific product vs. the number of that’s order. Note that you have to hover any specific product graph to see the accurate return percentage of that product in the index table. Refer to the screenshot here. In This report, the app also shows the ‘Vender’, ‘Product Type’, ‘Total Order Qty’, ‘Total Return Qty’ and ‘Total Return Qty in %’ of every returned product in the lower index. Refer to the screenshot here. 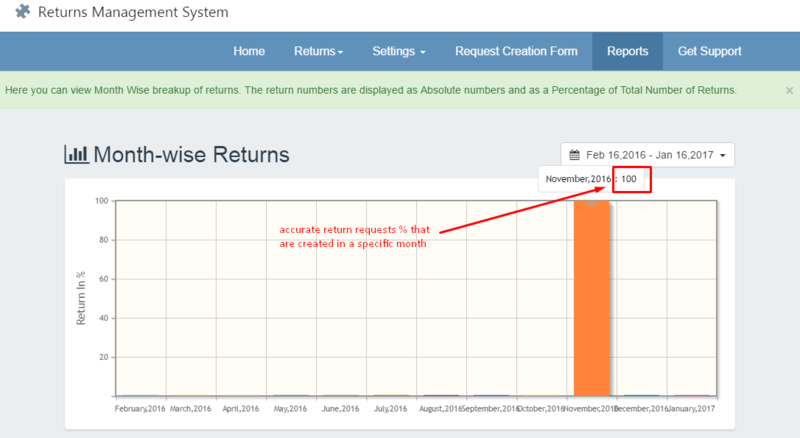 Month-wise Returns – In this report the app shows the percentage of return requests that are created in a specific month. 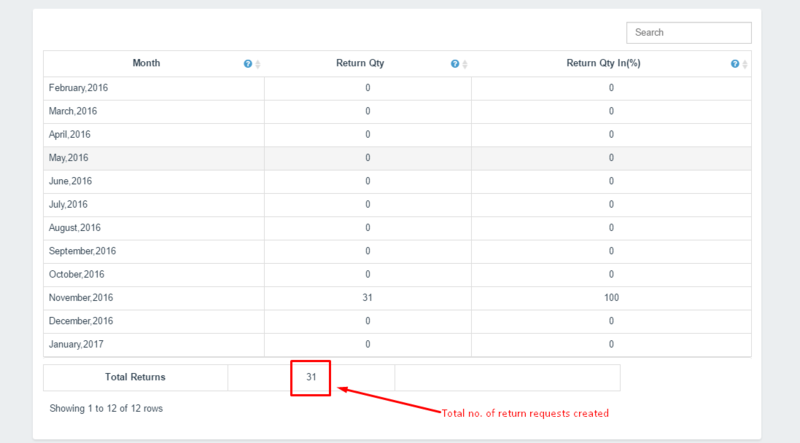 Note that you have to hover any specific month graph to see the accurate percentage of return requests that are created in that specific month. Refer to the screenshot here. In this report, the app also shows the ‘Return QTY’ and ‘Return QTY in %’ of returns for each specific month in the index table. Refer to the screenshot here. Product Share in Returns – In this report the app shows the percentage of each specific product vs. all returns products. This report shows in the Pie structure format. Note that you have to hover any specific product that is in the Pie structure to see the accurate return percentage of that product vs. all returned products. Refer to the screenshot here. In this report, the app also shows the ‘Vendor’, ‘Product Type’, ‘Return Qty’ and ‘Return Qty in %’ of each specific product that is returned in the index table. Refer to the screenshot here. Return Reason Wise Returns – This report is a lot of same as ‘Product Share in Returns’ type report. This report shows the percentage of each specific return reason vs. all available return reasons that is selected by the customers for each specific product. To see the accurate percentage of any specific return reason, you have to hover that reason’s area in Pie structure. Refer to the screenshot here. In this report, the app also shows the ‘Return Qty’ and ‘Return Qty in %’ of each specific return reason in the index table. Refer to the screenshot here. Return Resolution Wise Returns – This report is same as ‘Return Reason wise returns’ type report. 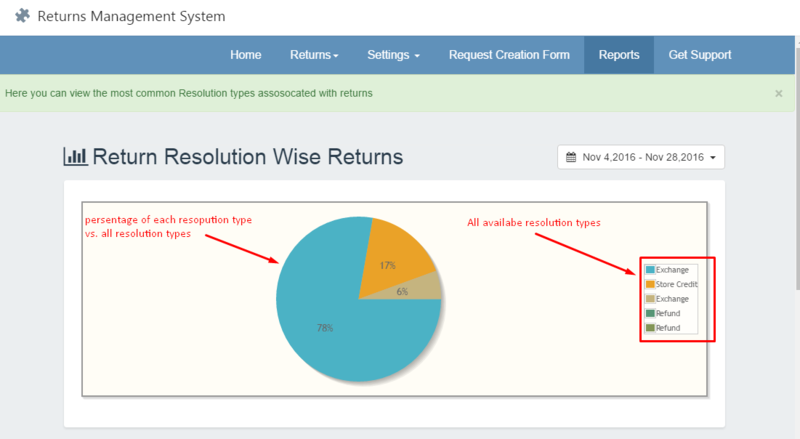 This report shows the percentage of each specific return resolution vs. all available return resolution that is selected by the customers for each specific product. To see the accurate percentage of any specific return resolution, you have to hover that resolution’s area in the Pie structure. Refer to the screenshot here. In this report, the app also shows the ‘Return Qty’ and ‘Return Qty in %’ of each specific return resolution type in the index table. Refer to the screenshot here. Note: The app provides a date filter in all above reports. You can simply pick the start date and end date of the time interval of which you want to see the reports. Refer to the screenshot here.